You can find many articles explaining the importance of a properly calibrated monitor. And if you are critical about the range of colours you shoot and wish to print, you need a monitor that can display all or most of the AdobeRGB colour space. The HP DreamColor monitors have been available for a few years now, competing with the high end professional display market. 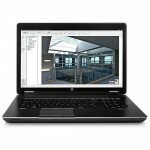 But this year HP released an updated Z24x 24 inch DreamColor at less than a third of the price of the previous model. And a new 27 inch DreamColor, the Z27x. Realising the photographic industry is a specialised group that is not adequately supported by the normal computer channels, HP New Zealand appointed two photographic companies as advocates and resellers to address this. Evoke is please to be one, and offers 30 years experience in the computer industry as well as 8 in the photographic industry. We can assist with selecting a display or an HP Workstation configuration that best fits your requirements and budget. The HP DreamColor ZBook 17 is the only high performance portable workstation with a professional colour display. With three drives on board you get performance and space for a truly portable computer.